Description: Northbound empty coal train gets permission from the CN dispatcher to head through town - BNSF Beardstown Sub. Description: BNSF 4155 prepares to leave Paoli with train Z-WSPALT9-19A. Description: Marmot rail fanning on rock. Description: BNSF train H-KCKBAR1-22A rolls through Abo Canyon. Description: We get some fairly diverse power on BNSF Train S LBTLPC1 07 as a KCS SD70ACe and Warbonnet join in. Description: Here's a BNSF Stack Train passing some local power headed towards Santa Fe Jct. and the KCT Argentine Connection Flyover from Argentine Yard. Description: Coming into Argentine on the BNSF from the KCT Argentine Connection Flyover was a Warbonnet Led BNSF Train M GALKCK1 17 past some ATSF Searchlight Signals as another stacker heads out with a full tank of fuel, ready to rock on down the Transcon. Description: I thought it was a regular Swoosh Dash 2 before it got this close. Such a great surprise! Description: Finally, caught one on the curve north of Annada on the K line! 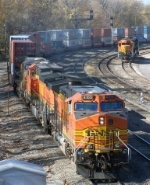 Description: BNSF 4155 just north of Annada MO on the K line. 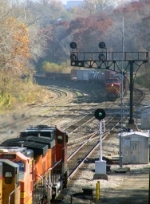 Description: BNSF 4155 East @ Rochelle, Illinois with a intermodal train.